The Idaho Transportation Department (ITD) is committed to compliance with Title VI of the Civil Rights Act of 1964 and all related regulations and directives. ITD assures that no person shall on the grounds of race, color, national origin, gender, age, or disability be excluded from participation in, be denied the benefits of, or be otherwise subjected to discrimination under any ITD service, program, or activity. The department also assures that every effort will be made to prevent discrimination through the impacts of its programs, policies, and activities on minority and low-income populations. In addition, the department will take reasonable steps to provide meaningful access to services for persons with Limited English Proficiency. #catchKenny at work inspecting bridges across the state to support your mobility and safety. Spring 2019: Topics include winter maintenance operations across the state, remembering fallen coworkers and how Idaho Governor Brad Little is helping spread the word about the importance of the Star Card. 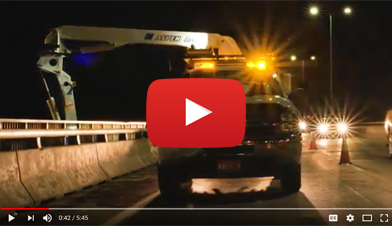 Winter 2019: Taking a closer look at drone use within ITD—and how swift planning and design helped shape an expedited construction schedule on Boise’s Interstate 84 Cloverdale Bridge highlight this edition of ITD In Motion with Jennifer Gonzalez. 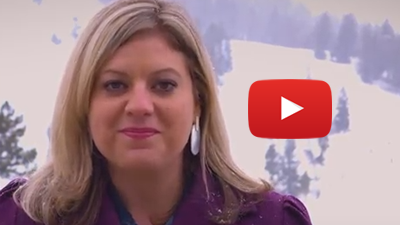 2018 ITD Annual Report: This video report highlights the positive results of ITD’s commitment to your safety, your mobility, and your economic opportunity. Fall 2018: A focus on bridge inspections and safety. Summer 2018: The latest news about roadside maintenance, ITD innovation, and the Autonomous and Connected Vehicles Testing and Deployment Committee. Employee Safety: A review of the new ITD employee safety vest, winter mobility numbers and DMV news. Winter Operations: We take a closer look at two aspects of ITD’s winter operations. 2017 Year in Review: A look back at a very busy year in review at ITD. Projects: We highlight the projects and people that are making headlines across Idaho. 100 Deadliest Days: The 100 deadliest days are the time from Memorial Day to Labor Day that sees a spike in highway fatalities. ITD Is promoting education to reduce these statistics. Statewide Project Highlights: These projects show how ITD integrates our mission statement into what we do. Your safety, your mobility and your economic opportunity. Eclipse: The 2017 solar eclipse is expected to bring thousands of people to southwest Idaho. 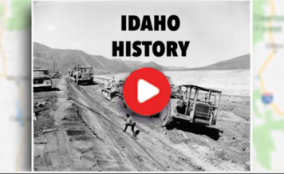 Curious how Idaho’s roads were built? Looking for historic photos of your community? Researching the evolution of snow plows? The Idaho Transportation Photo Collection is a free, online database with more than 30,000 images documenting the rich history of transportation and infrastructure development in the Gem State. From surveying and constructing the North and South Highway to dedicating Idaho’s Interstate Highway System, every corner of Idaho is represented in this unique collection captured by the Idaho Transportation Department. Spurred by a vision to operate more like a business, and motivated by an annual funding shortfall in the hundred of millions, in 2014 the department launched a strategy to engage employees to find solutions to everyday problems. The centerpiece of this innovation strategy is an employee-driven effort. Rather than rely on the brainpower of a select group of leadership-level people, ITD is harnessing the creativity of all employees statewide. Employees at every level are encouraged to submit ideas for time and money savings and making processes more efficient. But this is not just an old-fashioned suggestion box. Employees work to implement the best ideas that have a measurable impact. Employee innovations are submitted in one or more of these seven categories: Safety, Mobility, Economic Opportunity, Employee Development, Customer Service, Cost Savings, and Time Savings. 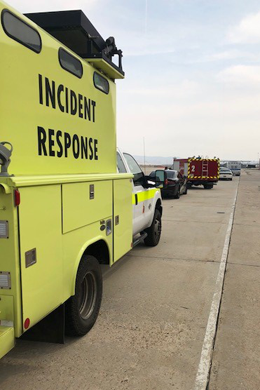 The Idaho Transportation Department’s Traffic Incident Management or TIM Program is dedicated to improving the on-scene safety of Idaho’s incident responders. By increasing outreach and awareness of TIM practices, the program can increase the reliability of Idaho roadways and the livability of our communities. It’s federally developed and delivered across the nation: Developed by FHWA and offered in partnership with AASHTO, the national TIM training curriculum is pilot-tested and based on best TIM practices and advanced standards. To date more than 335,000 TIM Responders across the U.S. have received the training. It’s customizable. Training can be delivered in its entirety or through select modules in almost any setting. Traffic Incident Management is accepted by the Idaho EMS Bureau as continuing education. To respond effectively as a team, we must train as a team. Traffic Incident Management consists of a planned and coordinated multi-disciplinary process to detect, respond to and clear traffic incidents so that traffic flow may be restored as safely and quickly as possible. TIM Responder Training brings together personnel across the responder spectrum to build a stronger, more coordinated corps at the local and national level. The Goal is to provide quarterly training based on geographic regions to all of Idaho in the coming years. 396 Incident Responders have been trained. 118 TIM Trainers have been certified. Why is Traffic Incident Management IMPORTANT? Crashes and “struck-by” incidents continue to be a leading cause of on-duty injuries and deaths for public safety responders and support teams responding to highway incidents. Traffic incidents are a contributing factor to congestion in the U.S. For every minute a freeway lane is blocked due to an incident, it results in four minutes of travel delay. Less time spent in backups, fewer secondary crashes and fewer insurance claims means less financial loss due to highway incidents. Who is involved in Traffic Incident Management? A life-long transportation professional, Brian W. Ness became Director of the Idaho Transportation Department (ITD) in 2010. He is responsible for an annual budget of around $800 million and provides leadership and vision for 1,600 employees. In April 2018, Director Ness was appointed to the Transportation Research Board’s (TRB) Executive Committee. The TRB is a unit of the National Academy of Sciences, Engineering and Medicine, and serves as an independent adviser to the President of the United States, the Congress, and federal and state agencies on scientific and technical transportation issues of national importance. In March 2017, he became chair of the American Association of State Highway and Transportation Officials’ (AASHTO) Special Committee on Research and Innovation. He was President of the Western Association of State Highway and Transportation Officials (WASHTO) in 2016. In this position, he served as a regional representative to AASHTO’s Executive Committee. In addition, Director Ness sponsors the WASHTO Highway Transport Committee. He is also the creator and sponsor of WASHTO’s Emerging Leaders Program. Director Ness chaired the AASHTO Special Committee on Transportation Security and Emergency Management (SCOTSEM) until August 2017. Through his leadership of SCOTSEM, he achieved national recognition for applying his organizational model to emergency management and security, which has helped reshape SCOTSEM’s strategic plan. He is a member of the AASHTO Board of Directors, the WASHTO Board of Directors, and the Idaho Rural Partnership’s Board of Directors. He is also a member of the Pacific Northwest Economic Region Idaho Council. Director Ness is a nationally recognized authority on organizational realignment and speaks regularly at national conferences for both the public and private sectors about how to structure a more effective and accountable state government. He leads a seminar each year on his “Nine Steps to a Results-Focused Culture” for the National Transportation Leadership Institute’s (NTLI) senior and executive-level management courses. Director Ness was honored in 2012 as Leader of the Year by the Treasure Valley chapter of Women’s Transportation Seminar, and named Trine University’s (formerly Tri-State University) 2014 Alumni of the Year. He received the 2016 Navigator Award from the national organization, Route Fifty. The award, in the “Agency and Department Chiefs” category, is based on his citizen-focused approach to government and transformative style. In 2013, ITD earned AASHTO’s President’s Award for Administration for its realignment efforts. Since Director Ness joined the department, ITD has received nearly 140 national awards for its programs and projects, including the prestigious Francis B. Francois Award for Innovation. 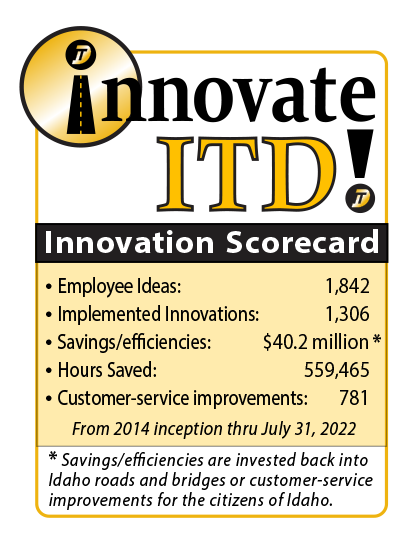 Under Director Ness’ leadership, ITD began an employee-driven innovation program in 2014. 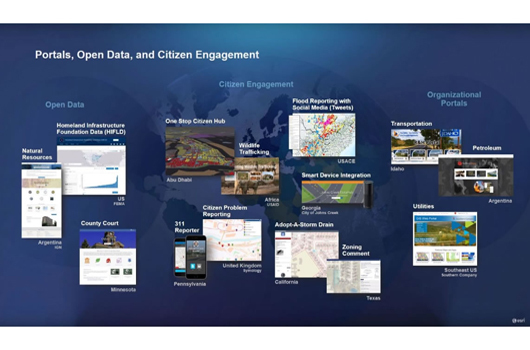 Since that time, the department has implemented more than 1,000 innovations, saved nearly $9 million, created nearly 600 customer-service improvements, and saved 207,000 contractor and employee hours. The department was recognized in 2016 by the Idaho Technology Council as a finalist for Innovative Company of the Year. Director Ness earned a Bachelor of Science degree in Civil Engineering from Tri-State University and a Master’s degree in Public Administration from Western Michigan University. He is a licensed professional engineer in Michigan and Idaho. Before becoming director at ITD, he worked for 30 years at the Michigan Department of Transportation (MDOT), holding a variety of positions in research, operations, aeronautics, construction, and project development. Director Ness ended his career with MDOT as the North Region Administrator/Engineer. Scott Stokes, a 25-year Idaho Transportation Department veteran, became chief deputy in 2007 after a long tenure as district engineer in northern Idaho. As chief deputy, Mr. Stokes oversees the divisions of Aeronautics, Motor Vehicles, and Transportation Performance and has primary responsibility for much of the department’s daily operations. Mr. Stokes is chairman of the Idaho Traffic Safety Council and is intimately involved in all facets of highway safety for the department. He is a leading advocate of the drive to achieve zero deaths on Idaho highways. In support of ITD’s strategic plan, Mr. Stokes also is engaged in the department’s internal and external efforts to promote economic opportunity through transportation and to increase mobility for Idaho travelers. He is a member of ITD’s four-person executive team and reports to the director. A second-generation ITD employee, Mr. Stokes joined the department in 1992 and served as the state bridge engineer early in his career. He earned bachelor’s and master’s degrees in civil engineering from Brigham Young University and worked for a private engineering firm about eight years before joining ITD. Travis McGrath started with ITD in late March 2017 as the new Chief Operations Officer after a national search following Jim Carpenter’s retirement. Travis came to ITD after more than 18 years with Golder Associates, a private-sector geotechnical and environmental engineering consulting firm. For the last seven years, he served as Golder’s Pacific Northwest and Alaska Operations Leader. In that role, he was accountable for the performance of a 180-person team across multiple offices. Travis practiced in structural and geotechnical engineering early in his career, before specializing in transportation project risk assessment and risk management. He led risk assessments for a dozen state transportation agencies, FHWA, and FTA. McGrath brings a strong military background to this position. He served as a Combat Engineer officer on active duty and in the reserves for more than a decade. He led a line platoon during Operations Desert Shield and Desert Storm, and subsequently served as a heavy-equipment platoon leader and company operations officer. He is a strong communicator and consensus builder, with proven decision-making experience and an understanding of the engineering side of operations. McGrath has a history of setting the vision and holding those around him accountable, with a passion for teamwork and continual improvement. Travis earned a Bachelor of Science in Civil Engineering from Seattle University in 1989, and a Master of Science and Doctor of Philosophy in Civil Engineering from the University of Texas between 1993 and 1998. He is a registered Professional Engineer. Brenda Williams brought an extensive background in human resources to the Idaho Transportation Department in October 2013 when she became the department’s Chief Human Resources Officer (CHRO). Recently, she was the Area Human Resources Manager for Republic Services (formerly Allied Waste Services), in Salt Lake City, where she provided strategic leadership for multiple states. She achieved key business objectives in the areas of development, succession planning, and performance management. Republic is a Fortune 500 company that specializes in environmental services with 31,000 employees in 40 states, including Idaho. Williams was also the Director of Human Resources for Comcast Corp., (formerly AT&T Broadband), in Salt Lake City, for multiple locations throughout the state. She was instrumental in driving employee engagement through management and employee action teams. Williams was promoted to the position after serving as Director of Staffing and Organizational Development for AT&T Broadband. After a successful career in the private sector, Charlene “Char” McArthur assumed the position of Chief Administrative Officer at the Idaho Transportation Department in October 2013. She previously served as the Global Corporate Controller for the Fluke Corp., a Danaher Operating Company located in Everett, Wash. She was responsible for the company’s financial reporting, internal control, and managing working capital targets of more than 20 subsidiaries throughout the world. Char attributes her success to developing skilled, dedicated and engaged employees who strategically focus continuous improvement efforts on the organization’s strategic priorities. 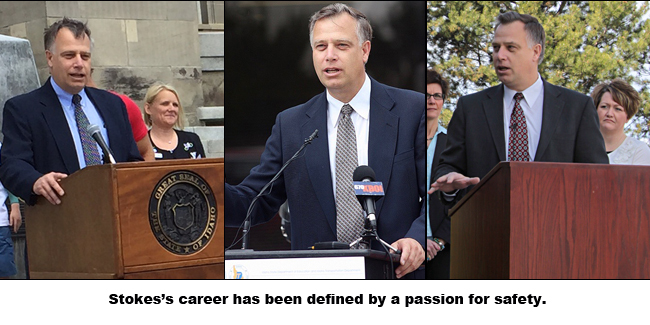 McArthur, a Boise native, graduated from Boise State University with a BBA in accounting. She has worked in both public accounting and private industry. Char is a licensed CPA. 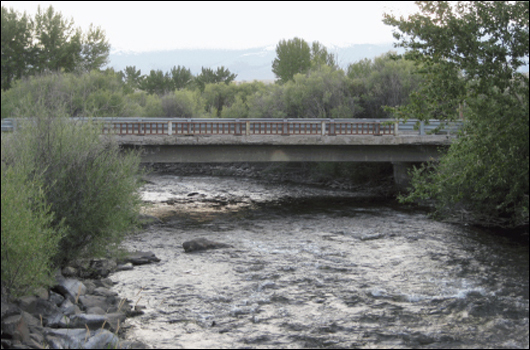 The Excellence in Transportation Awards are sponsored annually by the Idaho Transportation Department to recognize outstanding initiatives in developing, planning, and implementing transportation projects throughout Idaho. The awards program also recognizes ITD employees in transportation-related fields who have made exceptional contributions to the organization. Details regarding the submission deadline will be anounced at a later date. Awards winners are recognized during an Idaho Transportation Board meeting. Any consulting/construction contracting firm or agency engaged in transportation-related projects in Idaho is eligible to enter. Submitted projects must be located in Idaho. The entry must be associated with a public transportation improvement, project and/or funded by transportation dollars and fall into one of the award categories listed below. See specific category criteria for project completion eligibility requirements. Entries submitted in previous years may be resubmitted if it still complies with the aforementioned time span. Winning entries from previous years are ineligible. A project may be entered in as many categories as desired; however, a separate application must be submitted for each category and address its specified criteria. Project Recognition and Award – One award will be presented to the winner of each category. Each winning entry will have the opportunity to present up to three additional awards to other firms/agencies who may have contributed to the project. Also, up to six certificates of recognition may be given to the project’s key personnel. Any ITD or non-ITD individual may submit a nomination for one of the four personnel categories. Please review the eligibility requirements for each personnel award category because they vary. ITD Personnel Recognition and Award – One plaque will be presented to the winner of each category. For any questions or comments regarding the application process or the Excellence in Transportation Awards in general, please contact Adam Rush at 208-334-8119 or adam.rush@itd.idaho.gov.